One thing Stephen and I have talked about for a long time now is visiting as many temples as possible with the boys and letting them walk around the grounds and what not. 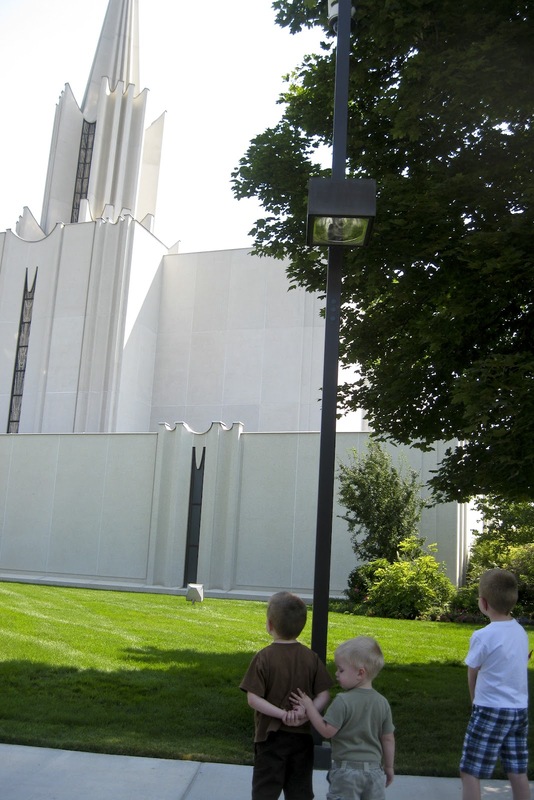 Last week we walked around the South Jordan Temple. I've never been close to that one. It was fun. My small camera is having issues and that's all I had with me so this is about the only shot I got. 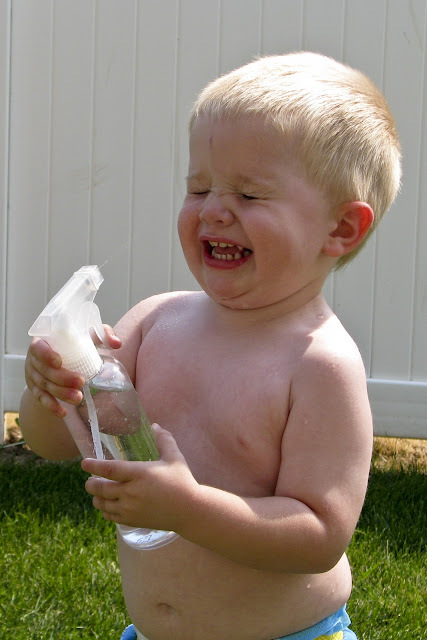 The boys had fun getting wet and spraying each other with water with spray bottles. Porter even had fun spraying himself with water. 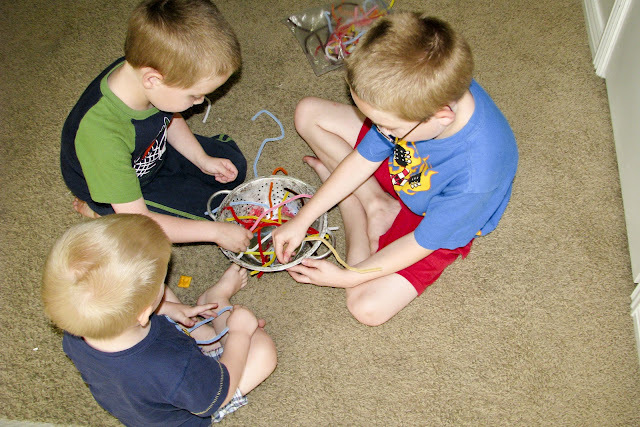 Another activity we did was pulling pipe cleaners through a colander. It was a simple activity yet, it kept the boys busy and having fun for some time. 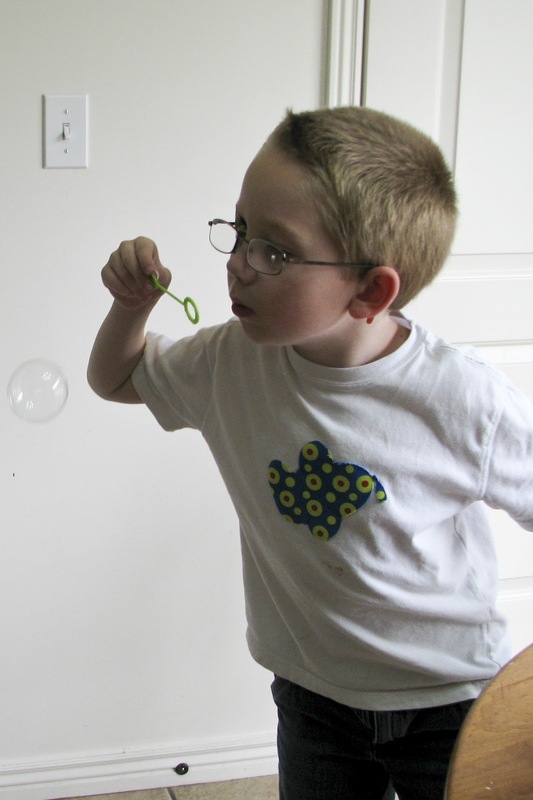 Another activity we did was making bubbles that bounce a little bit before they pop. It was real cool. Here is Vance blowing one of the bubbles. On Saturday I made Porter say good bye to his pacifier. He loves it and I had restricted him to only using it at nap and bedtime. I knew it'd be rough. 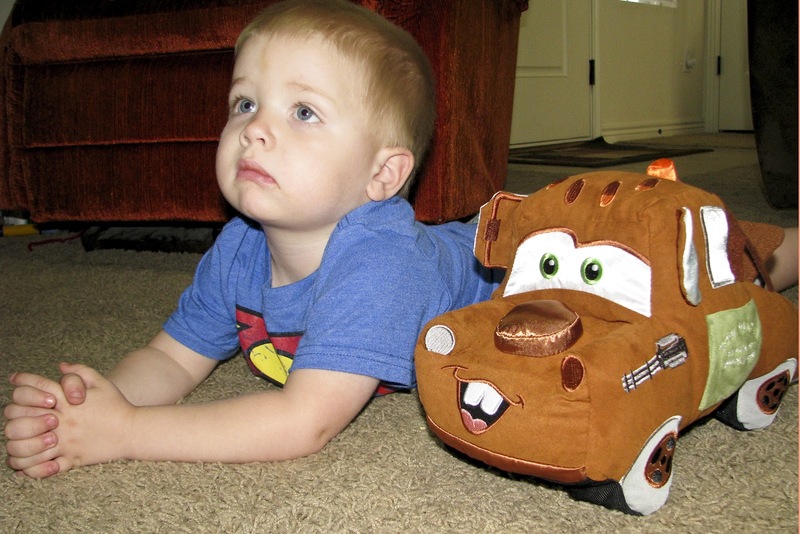 We cheered for him when he threw them away and then I gave him this cute Mater in exchange. He loves his Mater, but was definitely still missing his pacifier. He cried and cried for it on Saturday and was still looking for it on Sunday morning. He is doing much better now though and hasn't brought it up since yesterday morning. Sick time! Yucky. Porter and I still have colds, but on Sunday we were all battling something. Tanner was the worst. I will spare details, but it was lame and the boys didn't end up doing their talk or scripture at church for obvious reasons. Anyway, Stephen decided to cheer them up by showing them a lego set they didn't know he had. Here was their reaction to it. 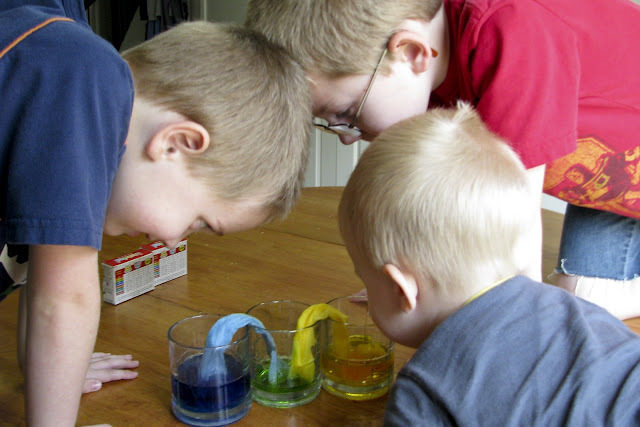 Here was a little experiment we did with colored water, paper towels, and cups. It was cool. Although the boys were very impatient as the water moved up the paper towel. 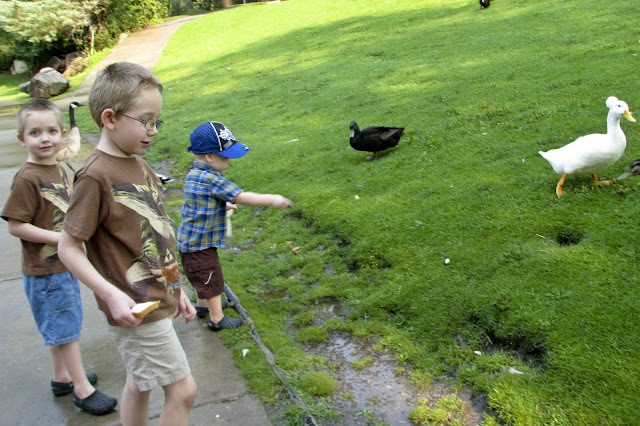 This morning we went and fed the ducks and geese at a nearby park. It was fun. The boys really enjoyed it. Porter tried to chase down the ducks when they wouldn't take what he offered out of his hand. Vance was trying to throw the bread as far and hard as he could. 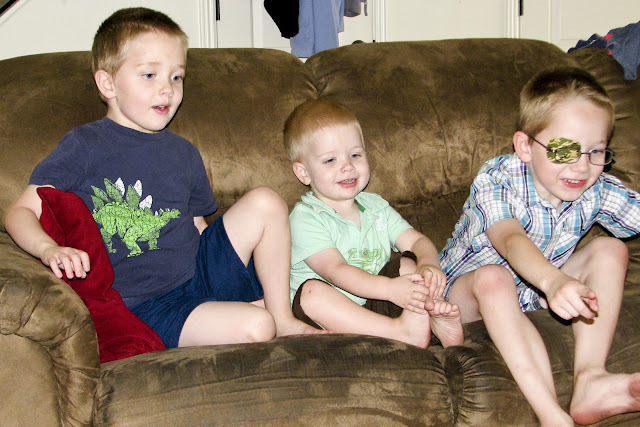 Tanner giggled and had a good time watching them come eat things up.